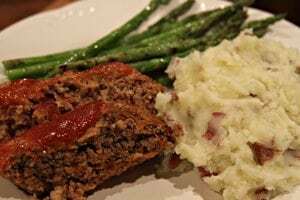 Here’s my take on a super simple meatloaf that is just about as easy as it is good. No chopping here! Two things of note: 1. 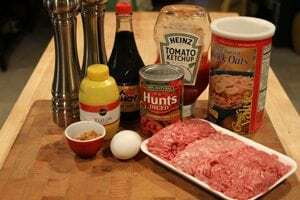 The recipe calls for ground beef, but you’ll see two kinds of meat in the pictures. In my local supermarket that sell a “meatloaf mix” that is part ground beef part ground pork. That’ll work great to; it’s up to you. 2. Check out this nifty little can of tomatoes. How awesome is this?? They did the work for you! 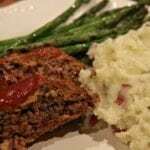 This is why it’s “quick and easy” meatloaf! Test it out and come back and comment below and let me know what you think. I always WELCOME your suggestions and comments. Also, have fun with it and let me know what you do to make it your own. 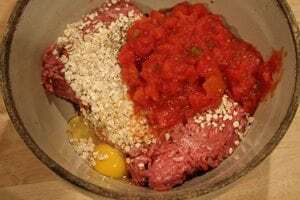 Combine ground beef, soy sauce, salt, pepper, egg, tomatoes, and oats and mix well. Pour into an ungreased 9X13 baking dish (Yep, no loaf pan here!) and form into a loaf. Pour into an ungreased 9X13-inch baking dish (Yep, no loaf pan here!) and form into a loaf in the center of the dish. 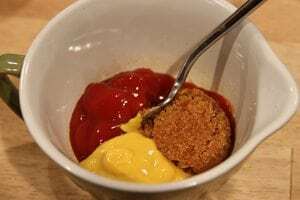 Mix ketchup, mustard and brown sugar together for topping. Absolutely! This is a fabulous meatloaf. Folks are always wanting to know the recipe. My family is the same way! Sometimes you just have to pull the wool over their eyes. My folks usually never notice! I hate celery but tried it anyway could not even tell. It was very good and easy. Wonderful! So glad you gave it a “go”! My wife is not a big celery fan either, but she loves this recipe. Made this for dinner last night and while I have a recipe that was similar this turned out way moist and delicious. My grandson enjoyed it tremendously and he is not a big meateater. So glad it turned out greta for you! I have never used soy sauce before in a meatloaft but this meatloaft came out perfect. I made it Ina 7by 11 pan . Thank you Stacey. Are you sure the canned tomatoes are in an 8 oz. can? It looks like the 14.5 size to me. 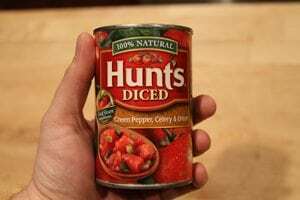 I don’t think diced tomatoes come in the 8 oz. Do you drain or use juice and all? Please advise. What a wealth of information. Thank you so much for your blog. I’ve recently found I get a kick out of cooking for my family and friends. So finding great recipes on your site is such a hoot. Thank you. I hope you’ll find lots you enjoy, Rickey! 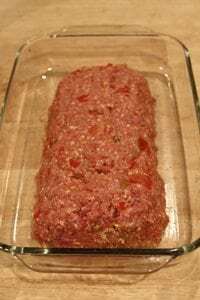 My wife loves this meat loaf,the only thing I changed was ,I doubled the recipe,used a 28 ounce can of plan petite tomatoes juice and all,1 tbs soy sauce,1tbs Worcester sauce.And let sit in the fridge for about 30 min to let the oats absorb the moisture,she said it was the smoothest tasting she has ever had. I’m so happy to hear that, James! So glad y’all enjoy it! I’ve been working on my meatloaf recipe for several years and you are one of the only other people that uses oatmeal as the bread component. Although mine does double the number of meats to four – beef, pork, lamb and bacon. Usually I’ll cook mine in either a 9″ cast iron skillet or 9″ cake pan. I saute the onions and bell peppers before adding them to meat mixture along with roasted garlic cloves and a couple of eggs. The inside of the skillet is wrapped in bacon then the meatloaf is ‘plopped’ inside with more bacon on top. Will cook 350 degrees for 35 minutes, pour of grease, cook another 35 minutes, pour of grease and then spread apply a thin layer of ketchup on top and bake for another 30 minutes or until internal temp is 160F. Good hot or cold. I’m going to make this, Nana’s mac ‘n cheese (with hoop cheese!) and fried corn tonight. I can hardly wait! Thanks so much! Regular Soy Sauce has gluten (Wheat) in it. May I suggest Tamari? It is gluten free for those of you that can’t eat wheat. Thanks. Appreciating the commitment you put injto your site and detailed information you provide. in a while tat isn’t the same old rehashed material. Fantastic read! I’ve bookmarked our site and I’m including your RSS feeds to my Google account. Maybe I missed something? This wasn’t my favorite. I followed the recipe exactly and it tasted salty and bland and the topping was so “vinegary”. Everyone kept asking if I added vinegar to the sauce. Too much mustard, I think. I do love your blog and am trying some other recipes, but I think I’ll stick to my tried and true meatloaf recipe. Hate to hear it didn’t turn out well for you. 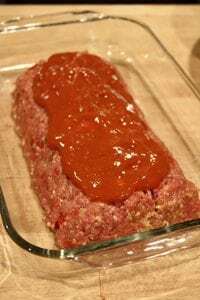 Have you tried my Secret Ingredient Meatloaf? Could you use 1/2 c bread crumbs with 1/2 c milk like in your other meatloaf recipe?